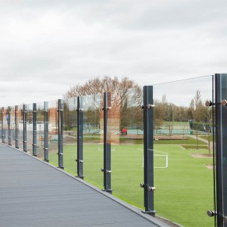 Delta Balustrades has designed the Mono range to offer a quality alternative to the Vista system, by combining its minimalistic look and feel with a range of materials and colours to complement any environment. The company has produced Mono's subtle steelwork frame with a single flat baluster to develop a truly versatile system. The beauty of Mono is its bespoke design. Demonstrate your individuality by choosing from a wide range of powder-coated uprights. Alternatively, choose to incorporate the rugged look of stainless steel.